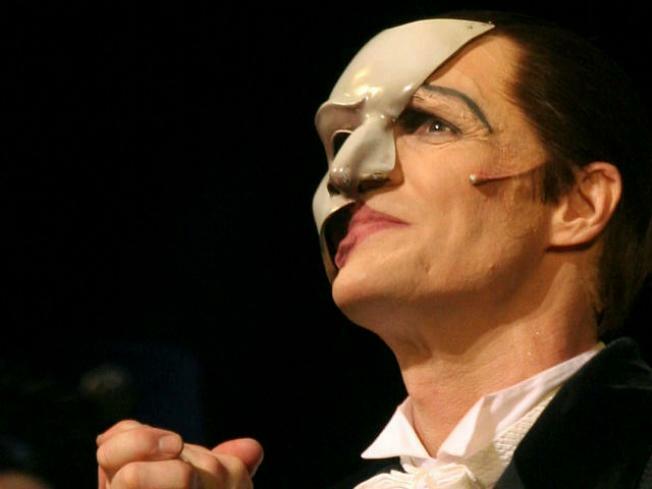 Howard McGillin, who stars in the role of the Phantom of the Opera in New York, acknowledges audience applause during the curtain call following a performance. Celebrate Halloween with the classic silent film "The Phantom of the Opera." The 1925, featuring Lon Chaney, will be shown at 80 p.m. at the Davies Symphony Hall in San Francisco. The complete film will be shown on a big screen while the score is performed by renowned organist Dennis James on Davies Symphony Hall’s Ruffatti organ. The Ruffatti organ is the largest concert hall organ in North America and celebrates its 25th anniversary this season. "The Phantom of the Opera" was directed by Rupert Julian and adapted from the Gaston Leroux novel by the same name. The film featured Chaney in the lead role as the masked and facially deformed Phantom who haunts the Paris Opera House, causing murder and mayhem in an attempt to force the management to make the woman he loves a star. It is most famous for Chaney’s intentionally horrific, self-applied make-up, which was kept a studio secret until the film’s premiere. The unveiling of his mask is one of the most famous moments in movie history. Tickets are $25 to $55 and are available through the SFS Box Office at 415-864-6000, or online at sfsymphony.org.